Deep River Snacks is, well, a snack food company. They make 5 product lines: kettle chips, classic chips, Honchos (tortilla chips), popcorn, and healthier baked crisps. Given that I love to munch on things, chips and popcorn are right up my alley, so I sought out their products. Except, it turns out, kettle chips are clearly the focus of the company. The Classic Potato Chips line has exactly one variety: salted. Same with the popcorn, just one flavor: salted. And same with the baked crisps. You guessed it: salted. Honchos are their version of Doritos, available in nacho cheese and ranch, plus peach habanero. Since plain salted items aren't really my thing, and I loathe Doritos, I stuck with the kettle chips only. "These are no ordinary kettle chips! Our kettle-cooked potato chips are made in small batches, ensuring outstanding crispness and crunch! Our Kettle Chips are a better-for-you snack made exclusively with sunflower oil. And, like all of our snacks, our kettle cooked chips are certified gluten-free, free from GMO ingredients, and made in a nut-free facility." 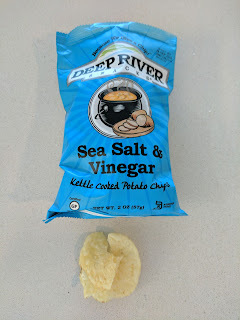 Deep River Kettle Chips are available in about a dozen flavors, ranging from your standard salted, salt & vinegar, and bbq, to slightly more interesting like Aged Cheddar Horseradish, Salt & Cracked Pepper, and Zesty Jalapeno, to downright fascinating New York Spicy Dill Pickle, Ninja Ginger, and Rosemary & Olive Oil, and a plain 40% Reduced Fat version for those who are attempting to be healthier, and somehow think kettle chips fit the bill. I can't speak on the reduced fat versions, but, the regular ones are not healthy chips. 280 calories in a bag of chips! (Sure, it says 2 servings, but, um, its a personal bag of chips, no one eats them in 2 servings). They are very classic, super fried, style chips. If you are looking for a standard kettle chip, check them out. "Deliciously fragrant and flavorful kettle cooked chips! 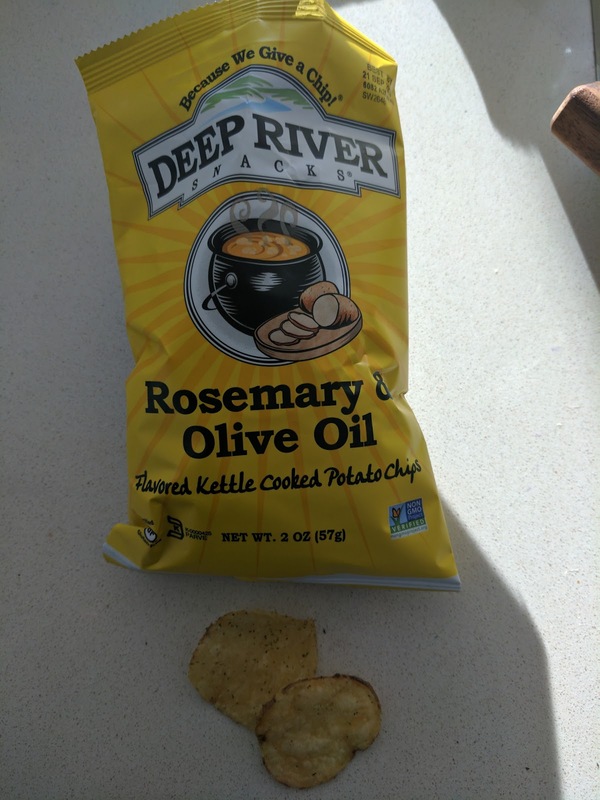 Rosemary, garlic, and olive oil marry perfectly with our kettle-cooked potatoes for a delicious chip with great crunch." These were very classic kettle chips. Super crispy, super oily, crunchy chips. My favorites are always the ones that are curled up slightly, or bent over. The flavor however was pretty unique. I don't think I've ever had rosemary chips before. I really liked them. I know it sounds funny, but, the more interesting herbs made them taste ... grown up? They really seemed like what a trendy bar would serve as a bar snack, "And here is our housemade rosemary kettle chips ..." They really didn't seem like a packaged snack. Anyway, a very unique chip, and I liked them. "A New England classic potato chip! The tart and tangy taste of vinegar paired with the perfect amount of sea salt is sure to make your mouth pucker. " These did make me pucker. Very tangy, classic salt and vinegar chips. Standard very fried kettle style. Not really my thing, but, a good version of what they are. "These kettle chips offer a four-alarm kick with only four ingredients! 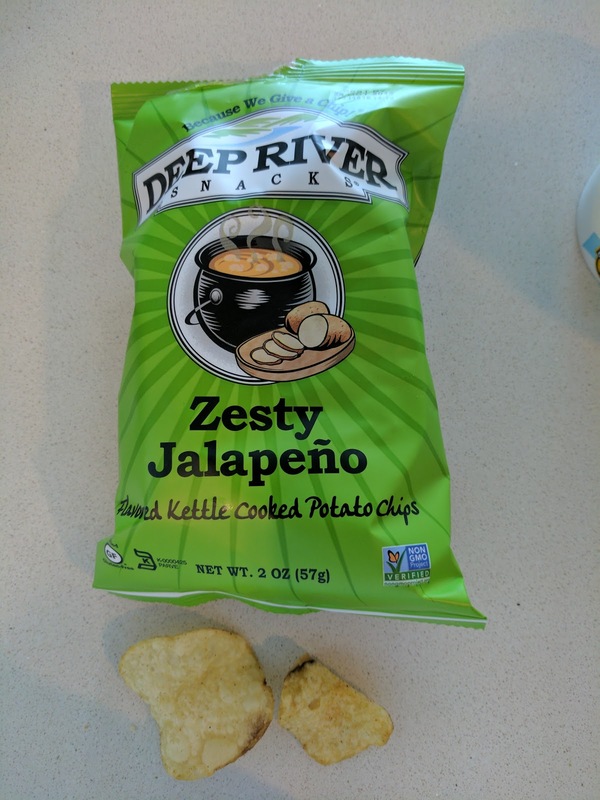 Impossibly simple and incredibly delicious, our Zesty Jalapeño kettle cooked potato chips are the perfect balance of flavor and fire." The Rosemary & Olive Oil were my favorites in that they didn't seem like packaged potato chips, but, for a classic potato chip, the Zesty Jalapeño actually wins. They were indeed fire-y. And again, classic kettle chip style. Ojan was eating a bag of these and absent mindedly took a big handful all at once. Several seconds later he was frantically running for water, as he had forgotten that they were so intense. I love to use my waffle iron for cooking. As you know, usually this is for reheating leftovers, as I've told you about my many adventures with waffling leftovers. But sometimes, I like to just throw random things into the waffle iron. Not necessarily "leftovers". Just, anything that you could put on a grill. Like figs. Why figs? Because, I picked a basket of figs (yes, really, I went to a farm, and picked my own figs! 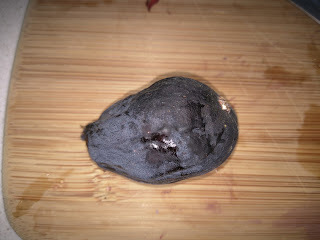 ), and after two days of eating a ton of fresh figs, I didn't want another fresh fig. But I couldn't let the final figs go to waste. They were too precious. Since I'm me, the first thing that popped into my head was: waffle them! Did it work? Amusingly, yeah. The Original:A slightly overripe fig. I started with a fig. Just a fig. It was slightly past its prime, getting a bit sad looking. I cut off the stem, and then literally put the entire fig into the waffle iron, whole. I did nothing else. After a few minutes, I checked on it. It had split open under the pressure from the waffle iron. The sugars all ran out into the waffle grills, creating a bit of warm fig jam. This was not a bad thing, and I used a chopstick to pluck out the jam. The fig itself got crispy on the outside, yet soft, warm, and gooey inside. The sugars that ran out also caramelized around the outside. A really fun combination of textures. It really was better than this fig would have been plain. Crispy, caramelized, sweet, gooey. I put in a second fig, and let it go a bit too long, so it got, uh, very caramelized. Just a touch too much, not horrible, and Ojan said it tasted like creme brûlée . Mmm. Creme brûlée. Also not a bad thing. I consider this experiment a success. 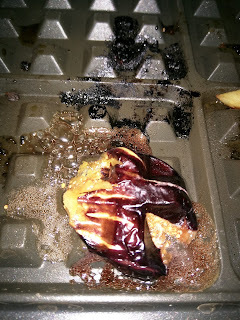 If you ever have fresh figs, and get a bit sick of eating them fresh, throw them on the waffle iron! I don't spend much time in the Los Angeles area. In fact, as crazy as this is, I hadn't really ever been there until a year or so ago, when I went to visit our office in Venice. I can't say I enjoy the city. I love the weather, the access to beaches, and the people watching, but, wow, I can safely say that in my 4 days there, I spent more time in a car than I have in the past year combined. Do not like. Anyway, on my recent visit, I had the chance to plan two dinners, one for just Ojan and I, and one for a larger group. For the larger group, we went to The Bazaar, where I had dined previously on my own last time I was in town, and noted that I really would enjoy it more with a group. For just Ojan and I, I selected ink. ink. is the restaurant of chef Michael Voltaggio. If you recognize his name, it is because he was the winner of Top Chef season 6, where he competed against his brother, also a chef. I didn't watch that season of Top Chef, but I've seen him on other food TV and was impressed with his skills (at least, on camera). My research seemed to back this up. Yes, a celebrity chef, but, one who is often in his restaurants, and, really does creative, but actually tasty things with food. So, we went to ink. on Sunday night, literally as soon as we arrived (delayed flight, whee). I loved the feel of the place immediately. The touches of an owner who truly cares about the dining experience, besides just the food, were obvious immediately. 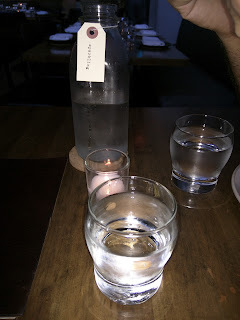 There were so many little things that added up, like complimentary house sparkling water (with a jug left for us on the table), the dessert menu provided at the start of the meal (planning ahead! ), and, overall, just a general comfortable feel. The food was unique and interesting, and although modern techniques were used, it was never in a gratuitous way. At no point did I roll my eyes and say, "Oh, another foam", or, "of course, more sous vide". Everything was deliberate and necessary. We enjoyed our meal, and I'd gladly return. The entry area was funny. 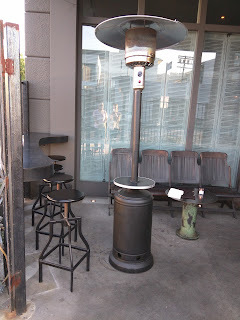 Metal stools on one side, and wooden stadium seats on the other? I feel like there must be a story here. 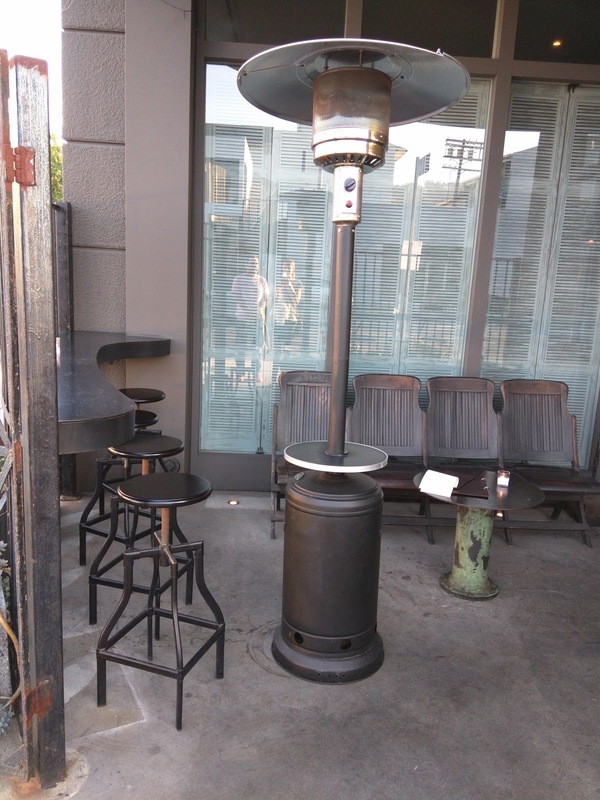 I imagine when they get busy that this makes for a nice area to wait, as it keeps patrons outside, and not crowding the restaurant itself. I don't know how to describe the style of the interior. 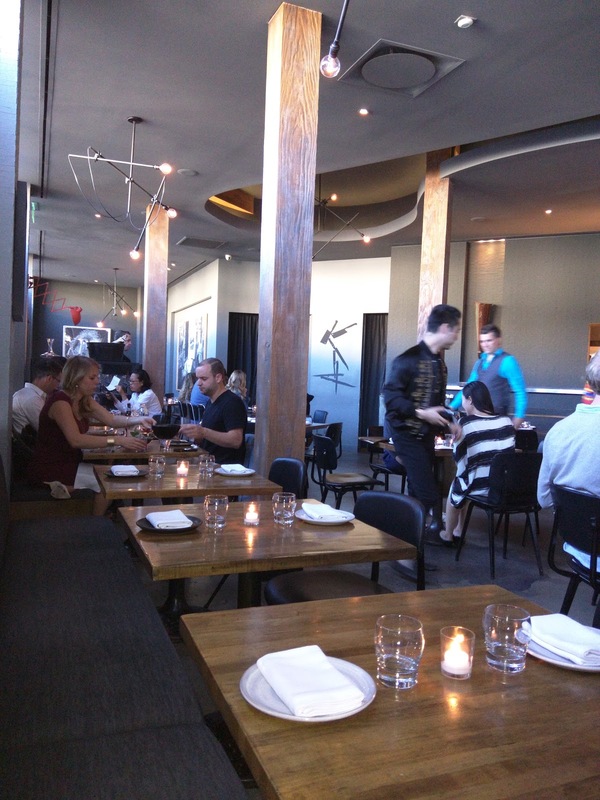 It matched the food in that it was interesting, unique, and trendy, but totally comfortable and approachable. Wood was prevalent. Exposed square wooden pools were located throughout. The windows had wooden shutters. Tables were wood. The lighting was also interesting. Little candles were located on each table. The ceiling fixtures had those clear bulbs with interesting filaments. Part of the kitchen was open behind a bar, the rest behind a wall, but with a large exposed pass, so you could somewhat see the action. Servers were dressed in all black, with black aprons, a bit more formal than I'd expect, but, it did add to a consistent experience. Service was good and friendly throughout, and all staff were excited to talk about the dishes. Once we sat down, we were offered house sparkling or still water. I really, really appreciate house filtered water. I always want sparkling water, but, $8+ a bottle is just more than I'm generally comfortable with. Plus, so many plastic bottles! 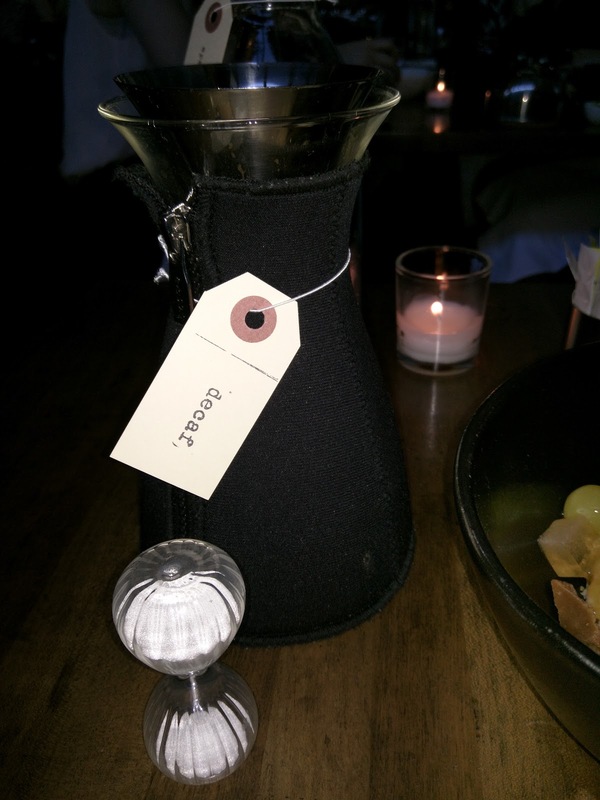 I also appreciated that they left a cute little jug on our table, so we could refill as needed. Another common dining pet peeve of mine is running out of water, and needing to rely on the server to refill. Once we emptied the jug, a replacement was brought. Excellent water service, all around. 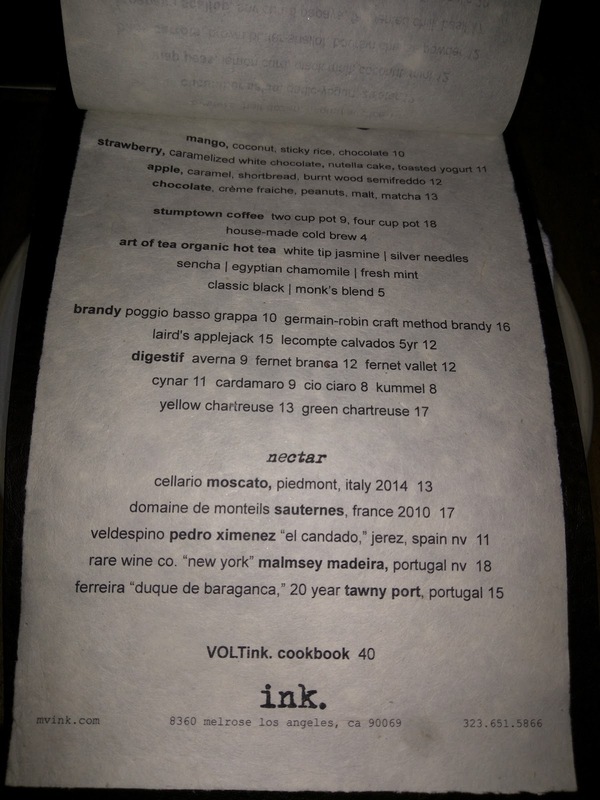 The drink menu is fairly diverse. 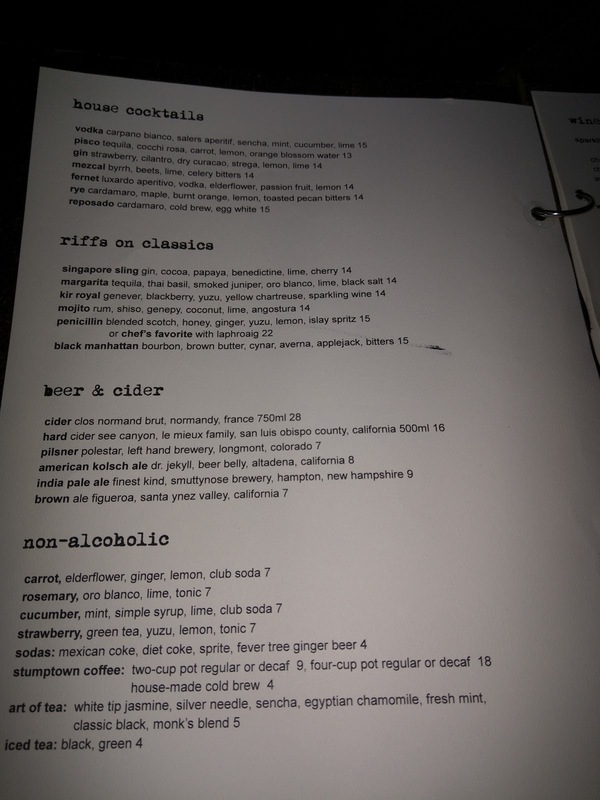 In addition to beer, wine, and cider, there are plentiful mocktails and a cocktail menu, broken into "House Cocktails" and "Riffs on Classics". Even coffee and tea selections are included in the drink menu, which was surprising to me, until the table next to me actually ordered coffee and tea the moment they sat down, which they sipped alongside their savory dishes. Is this an LA thing? I had a hard time narrowing in on one choice. From the "Riffs" section, the "penicillin" with scotch (laphroaig is the suggested chef's choice! 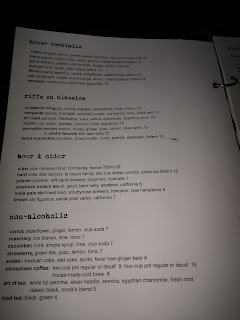 ), and honey, ginger, yuzu, and lemon was a pretty compelling option. As was the "black manhattan", comprised of bourbon with brown butter, applejack, averna, and cynar. But, in the end, I went for a house cocktail. "Gin: strawberry, cilantro, dry curacao, strega, lemon, lime." I selected the strawberry gin cocktail. It was a pretty drink, with a huge square ice cube in the center, a skewer with house made strawberry "sour patch candy" on top, and a sprig of some little flower. 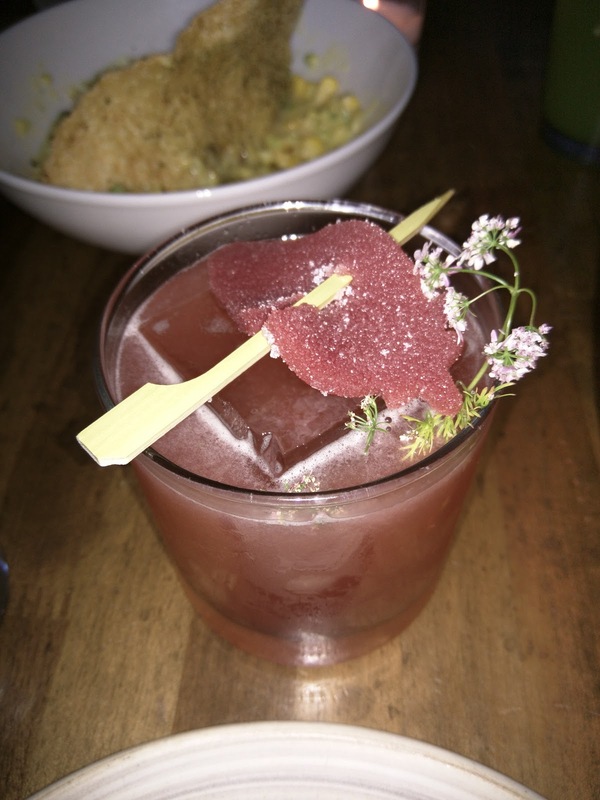 The drink was simultaneously sweet and sour, sorta like a sour patch candy itself. The candy on top was more like fruit leather, and it was totally delicious. It really did taste like sour patch candy, and, who doesn't like a bonus candy with their drink? I enjoyed this quite a bit. 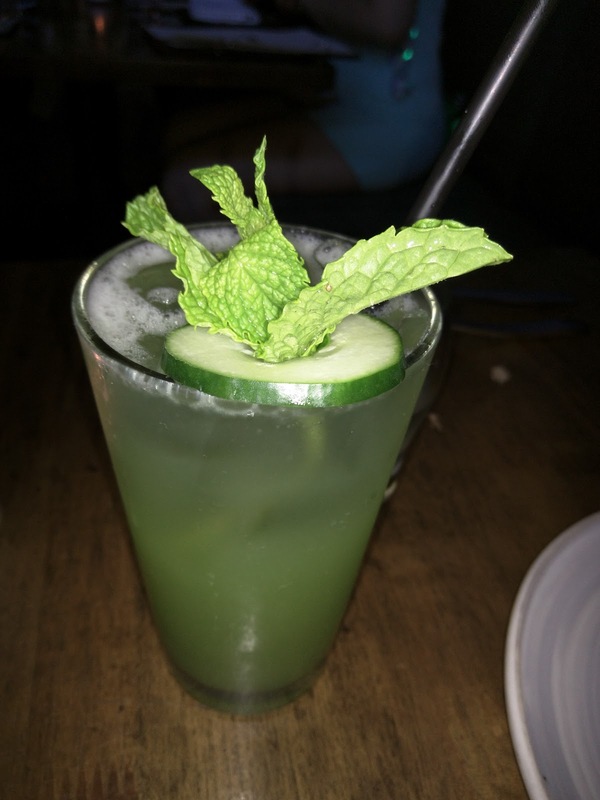 "Cucumber, mint, simple syrup, lime, club soda." Ojan also had a hard time picking his drink, from all the mocktails. In the end, he picked the one that sounded most refreshing, as it was warm out, and we had just walked there. I wanted him to pick one of the others that I wanted to try but, alas, it was for him after all, so he went for a cucumber based drink, not something I really like. I had a sip, it was fine, but tasted like cucumber, which is just not what I wanted. 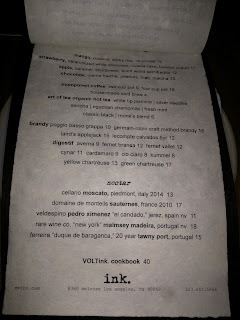 Once seated, our server came to introduce us to the format at ink. She told us it was basically a "design your own shared tasting menu", where all dishes will be served in the middle of the table, as soon as they are ready. We pick the dishes, and they'll course it out appropriately. She also gave us a rundown the menu, as it wasn't broken up into traditional "appetizers", "salad", etc sections. We learned that the menu starts with cold small plates, then raw dishes, then warm small plates, next pastas, and finally bigger entree items. 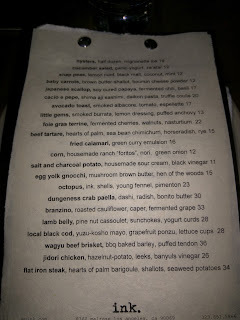 I had already picked 3 savory dishes for us to order, but our server told us that she recommended 4-6 for two people. I knew that neither Ojan nor I were particularly ravenous, and this was our first meal in the start of 3 weeks of nearly nightly eating out, so, we weren't looking for "restaurant portions", but, I gave in to the pressure an ordered an extra dish. It was unnecessary, and we ended up with two dishes unfinished. We did not select any of the raw dishes, nor any cold small plates, nor mains, opting instead for two small hot dishes and two pastas. Food arrived quickly. Too quickly actually. Our first two dishes were delivered before our cocktails. Before I had a chance to use the bathroom (I wanted to place our order first). The coursing was also a bit strange ... I expected the pasta dishes after the smaller plates, but, the first dish to hit our table was gnocchi. The second two courses came about 10 minutes later. We had no time to come up for air. I liked the menu format of mix and match, sharing, etc, but, I would have preferred a slower pace and more natural coursing. It was also interesting to me that even though everything was clearly designed for sharing, as we were told from the start "each dish will be placed in the center of the table", no serving utensils were provided. It wasn't necessary I guess, but, I could imagine some folks not wanting to serve with the same fork they were using to eat with? "Egg yolk gnocchi, mushroom brown butter, hen of the woods." The first dish to arrive was the famed Egg Yolk Gnocchi. It was, as I expected from my research, unlike any gnocchi I'd ever had before. At first glance, you could clearly see the mushrooms and brown butter, but, where was the namesake egg yolk? It turns out, the gnocchi *is* the egg yolk, mixed simply with oil and salt. That is right, no potato in this gnocchi. Just egg yolk, olive oil, and salt. It was as rich as you would imagine. Each gnocchi pillow was a delight to slowly bite into and savor, I loved the luxurious texture. The outside had a slight chew, but the inside stayed sorta under-cooked deliberately, keeping it gooey. Really fascinating and enjoyable. 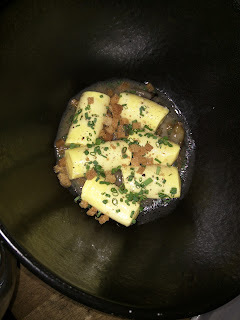 The gnocchi was served on top of mushroom brown butter, again, very rich, almost like a broth. It had great flavor, but, a little brown butter goes a long way! There were also chunks of hen of the woods mushrooms hiding underneath, that, strangely I didn't care for. I love exotic mushrooms normally, but, they were kinda just slimy and didn't compliment the dish well. However, Ojan, who doesn't really care for mushrooms, did like them. On top was a sprinkle of little crispy bread cubes. I loved these. They added the crunch that the soft gnocchi and broth needed. Overall, this was a wonderful dish. 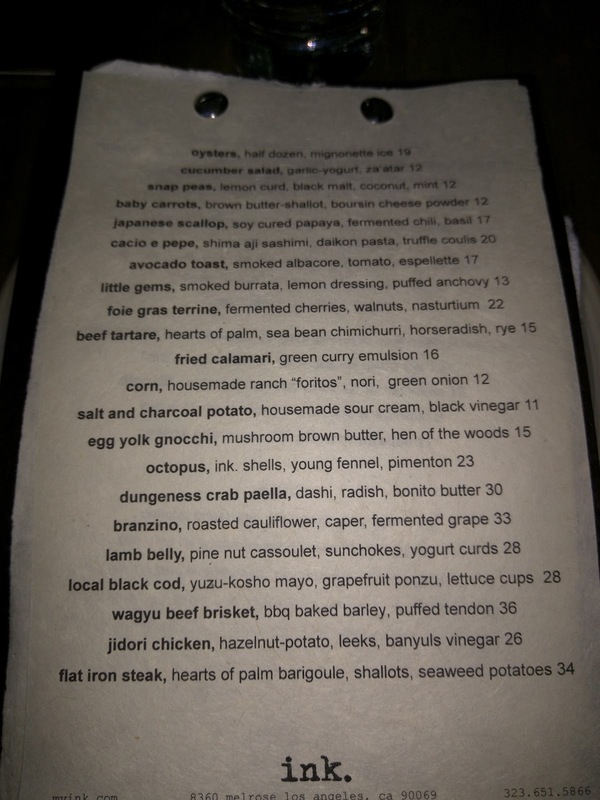 Great flavors and textures, although, I'd like to see something besides the mushrooms. Given the summer season, maybe peas or asparagus? It was my favorite savory dish of the night, Ojan's second pick. We'd get it again. "Corn, housemade ranch “foritos,” nori, green onion." Moments after the gnocchi was delivered, the dish I had expected to come first arrived, the "corn". 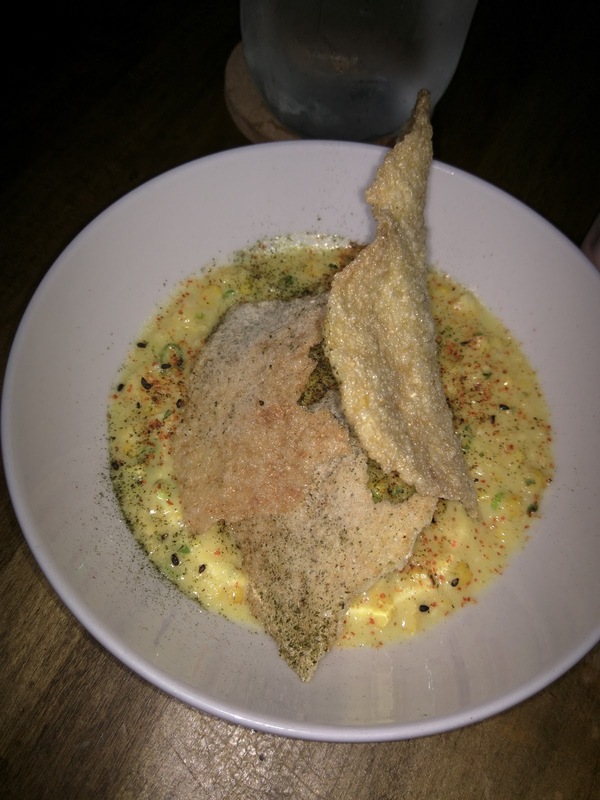 This was a hot corn porridge, topped with housemade ranch seasoning, and a couple huge "foritos", aka, faux Doritos. The porridge was ok, the corn kernels remained a bit crisp, so it wasn't just mush. But, I didn't love the flavor of it. As Ojan reminded me, I hate Cool Ranch Doritos, so, why would I like this? He had a good point. I was excited for corn porridge and for a crunchy element, and I do like ranch, but, uh, yeah, I hate Cool Ranch Doritos! And speaking of the foritos, these were crispy and reminded me of lentil crackers. So not only did I not like the cool ranch seasoning, I also really didn't like the bean-y base (not that I'm sure these were lentil based). I really disliked this dish, and only took a few bites. Ojan on the other hand really enjoyed it, and said it was his favorite dish of the night, while it was my least favorite. He easily polished it off. Salt and Charcoal Potato. $11. "Salt and charcoal potato, housemade sour cream, black vinegar." Next to arrive was our drinks, followed by the dish I didn't plan to order. I thought the corn porridge, the gnocchi, and the upcoming pasta dish would be sufficient, particularly given our dessert plans, but, when our server told us we should order 4-6 dishes, not 3, I felt kinda pressured into picking another. We opted for the potatoes because I had read many positive reviews of them. Potatoes are not something I'd normally order. 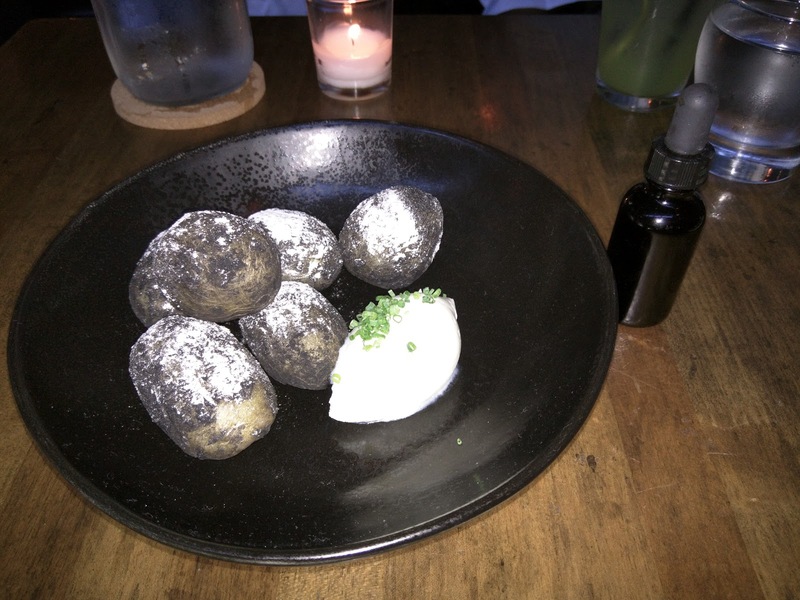 The potatoes were black on the outside, rubbed with a charcoal crust. This gave an intense smokey flavor that I liked. They are then coated in salt powder. This proved to be crazy effective, as these were salty, salty, salty. Served on the side was scoop of housemade sour cream, that was actually really delicious. I don't know how to describe it, other than that it was like ..."fresh sour cream". It really did taste like fresh cream, just, sour. Unlike any sour cream I've ever had before. Also on the side was a bottle with a dropper in it to serve black vinegar in the exact amount we choose. I thought it added an interesting flavor, but, Ojan preferred without. This was a fascinating dish, and I see why people talk about it. The salt level was extremely high, and really needed the sour cream to balance it out, in a good way. The sour cream was amazing. But, I'm just not into potatoes. Ojan pointed out that this was a good example of using creative techniques, like powder, very successfully. "It turns out, there is actual value in powdering something! ", he exclaimed at one point. This was both our third pick, and neither of us would get it again, but appreciated trying it. We really didn't need to order it though, and were not able to finish this dish. "Octopus, ink. shells, young fennel, pimenton." 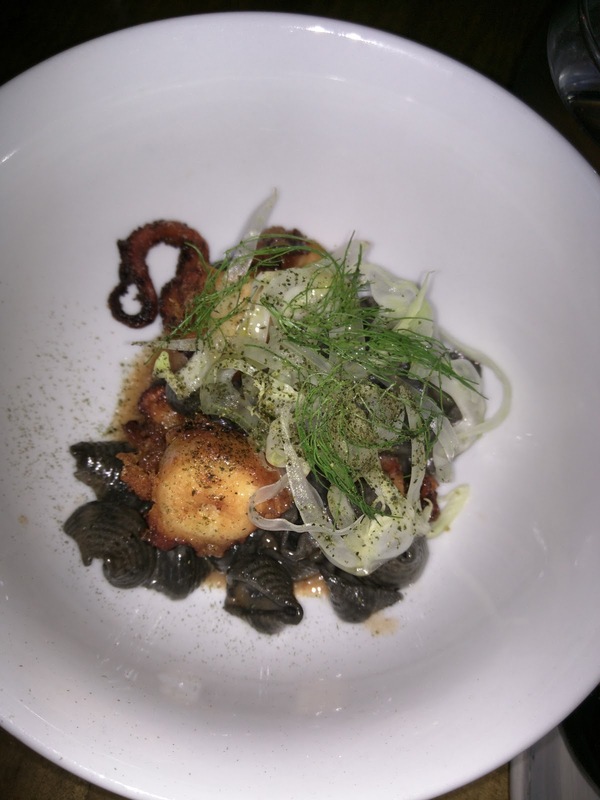 And finally, the octopus and squid ink pasta shells. The pasta was fairly standard ink shells, nicely cooked al dente. I do not know what the sauce was for this dish, but, sadly, I didn't like it, which made me not enjoy the shells, even though they were well prepared. On top was shaved fennel and young fennel greens. I think the pimenton was a rub on the octopus? Now, about that octopus. Wowzer. I've never, ever had octopus like this. Sure, you have likely had rubbery, awful octopus. And hopefully octopus that is prepared well and isn't rubbery. But have you had octopus that is .... crispy? I think it must have been slightly battered and deep fried? I'm really not sure. The texture was just downright incredible. The suckers were crazy crispy. Our portion included one long tentacle, and then slices of cut up tentacles. The octopus was just amazing, certainly the best I've ever had. Bite of the night for me. Sadly, I didn't like the sauce that coated the pasta, so, the overall dish wasn't as strong as the gnocchi, making it my second pick. I'd get it again, just for that octopus. Dessert was an interesting choice for us. Given the four options, normally, I'd pick the "mango, coconut, sticky rice, chocolate" dish, no question. I love every element in it. But, nearly every review I read of it said it was boring and just not great. Well, hmm. So, I was between the "strawberry, caramelized white chocolate, nutella cake, toasted yogurt" and the apple dish, easily ruling out the chocolate and matcha one due to caffeine. I asked our server about each of them. The strawberry one did sound great, and the "toasted yogurt" element is actually a froyo component. But ... she really lit up when she described the apple one. The astute reader might note that I always say I don't really like apple desserts. So, why on earth would I even think about the apple one? Well, it has been on the menu since ink. opened. No other dish has. And, every single review of it is people raving. I was so torn, between getting something that sounded good but people don't like (mango sticky rice), something safe (strawberry), or, the one that seemed like I wouldn't like it but everyone loves (apple). I let Ojan make the final decision. "Apple, caramel, shortbread, burnt wood semifreddo." Apple it was. And, wow, best decision of the night. This was a very, very good dish. While it certainly has its gimmicky aspect (ahem, frozen sphere that you crack open), it was actually just delicious. Ojan took the first couple bites, and immediately said, "Wow, this is better than I expected". A few bites later, he proclaimed, "This was the best dish of the night, by far". I agreed. In the very middle, under this all, was a disk of thick caramel pudding, described by the server as crème caramel. It was thick, rich, and more intensely caramel flavored than standard crème caramel. More like ... caramel flan? The caramel wasn't on top, but instead was integrated throughout. It was very tasty. Next,was the shortbread. Large chunks of shortbread, a bit harder than a standard shortcake, but more crumbly and chunky than a shortbread cookie, more like a biscuit. A great textural element. Another textural element was the crunchy, crispy shards along the outermost ring that we couldn't quite identify. I said they tasted like speculoos butter mixed with feuilletine. We were so fascinated by this that we finally asked a server what it was, and he said it was a sablé made with the caramel. He seemed a bit confused, but, that is what he came up with. Anyway, it had a great texture and was really tasty. Then, the apple. This came in two forms: little balls of apple coated in a sweet glaze and cubes of apple gelee. Since I don't love apple, I tried both, thought, "yup, apple", and let Ojan have the rest of them. And finally, the semifreddo, in the middle of it all. I cracked it open to find fluffy, creamy almost-ice-cream. It had a smokey flavor (I guess, "burnt wood"). The texture was really incredible. This was a fun dish to eat, and I really enjoyed trying every element separately, and then crafting up some "perfect bites". There was a creamy element, a sweet element, a crunchy element, a pastry element, a frozen element, a fruity element ... it had everything, but, nothing was extraneous. 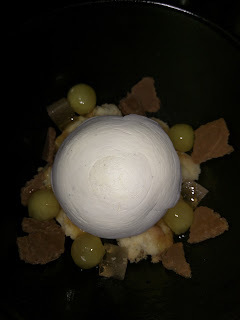 Ojan really thought that a composed bite with the apple, the custard, the crumble, and the semifreddo was incredible, so, if you like apple, this certainly was great. "It really tastes just like apple pie if you get all those components together! ", he exclaimed. I was happy enough with it even without the apple, and would order it again, apple and all. Although, I'm even more curious now to try a different dessert, given the clear skill of the pastry kitchen. Both Ojan and I agreed this was the best dish of the night, and either of us could have polished it off on our own, even though we had failed to finish our savory food. It took effort to share with each other. And to not order another. As usual, I ordered decaf coffee to pair alongside my dessert. Interestingly, they do not offer a single cup, only 2 or 4 cup pots are available. This is due to the brew method. The coffee was delivered alongside my dessert (points for not being after! ), but, it was delivered with the timer on the side you see here. I was supposed to wait for the timer to run out before drinking. Doh. I tasted each element of the dessert while waiting for my coffee to be ready. The dessert was so good I wanted more. But, I really wanted my pairing! So I waited patiently, while Ojan devoured more and more of the dish. I eventually stopped him, claiming my portion. Normally, he just wants a few bites and I get well more than half, but, this time, I only got my half. Did I mention the dessert was fantastic? Anyway, the coffee. It was fine. Not remarkable. I appreciated that it came with a neoprene sleeve to keep it warm. I appreciated that it was clearly labelled decaf. But I'd prefer the option for a single cup, that was ready to drink with my dessert. "DOSA combines the spices and authentic culinary traditions of India with a California focus on fresh, seasonal ingredients to deliver a diverse and impressive selection of dishes that have made it a Bay Area dining favorite." This was exciting to me for several reasons. First, I really enjoy indian food, so I'm always on the lookout for good options. Second, indian is one cuisine that I really don't mind getting as take-out, or reheating. Most food quality suffers quickly once prepared, but with indian, particularly curries, the flavor really just seems to get better. And third, I still don't really have a indian restaurant in San Francisco that I love. So, lots of potential here to satisfy me on a number of dimensions. If you aren't familiar with DOSA, they have two restaurants in San Francisco, one in the Mission on Valencia, one in Pacific Heights on Filmore. Their focus is South Indian, but for the Munchery dishes, it seems they wanted to appeal to a larger audience, and went for more familiar North Indian offerings. I visited the Filmore location a few years ago, and wasn't particularly impressed, but when I've had dishes prepared by the executive chef in other venus (like food festivals, cooking demos), I was blown away by the spicing. So, I was hopeful that this would be good. 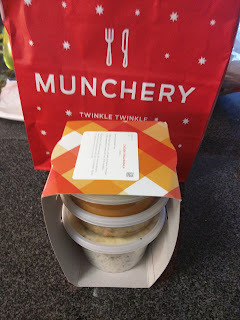 Since I've reviewed Munchery many times before, I'll skipping the general details of the order experience, and will focus only on what made this partnership more unique. As with all Munchery dishes, the menu is available about a week in advance for pre-order, or on-demand with about a 30 minute delivery time. The food arrives cold, and you heat it up when you want it. I'm not entirely sure the full details of the DOSA-Munhery partnership, as the website was pretty vague. I'm assuming the food is still prepared in the Munchery kitchens, by the Munchery staff, but the recipes were developed with someone at DOSA? I'm really not sure though. The partnership lasted a couple months, with different DOSA branded dishes on the menu each week, and then, the branding went away. Indian meals do still remain though. Not sure what happened there. Anyway, I was really pleased with the dish I tried, and can't wait to try another. If you'd like to try anything from Munchery, sign up with my referral code and you'll get $20 off your first order! 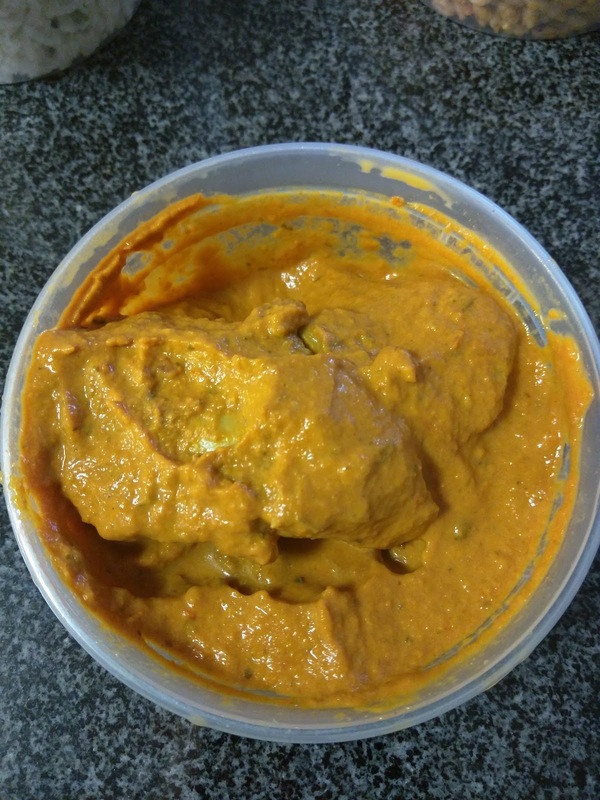 Munchery Photo: Chicken Tikka Masala. "Chicken tikka, which originated from the kitchens of the Mughal rulers of 16th-century India, are boneless pieces that are marinated in spiced yogurt and set on skewers in a tandoor oven. This is combined with a rich and flavorful tomato-based sauce. 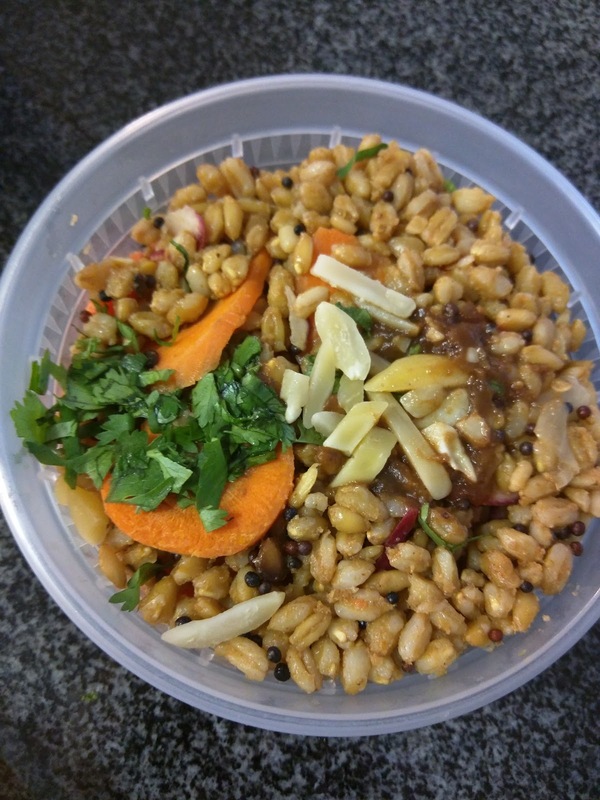 In addition to chicken tikka, we also prepared a side of spiced farro. This is hydrated in fire-broth "rasam" with radish, carrots and a tamarind dressing and served alongside coconut rice and naan." While I didn't expect my food to arrive looking like the photo, I did somewhat expect all elements from the photo to be included, and, they were not. This was disappointing. My tikka masala had no red peppers, there were no separate sides of green sauce or slivered nuts, and the side farro dish had no green beans. Of course, the description didn't mention any of these things, so, it was true to the description, but not the photo. But none of that *really* mattered. What I cared about was if the food tasted good, and, it did. It also was a great value, $11.95 for a full, complete meal of rice, naan, a side dish, and the main dish. I'd certainly get it again, and was eager to try more DOSA dishes (particularly paneer ones!). It was around the winter holidays, so my order arrived in a festive bag. Inside was a tower of plastic containers, bound together with a cardboard wrapping. This was different packaging than my previous orders from Munchery, but it had been a while since I ordered Munchery, so perhaps they've just switched it up? Previously, dishes came all in one cardboard container. Separating out the components makes a lot more sense to me, and likely helps them keep longer without drying out? Seems like a good move. The heating instructions were printed on the top label, for microwave or oven. 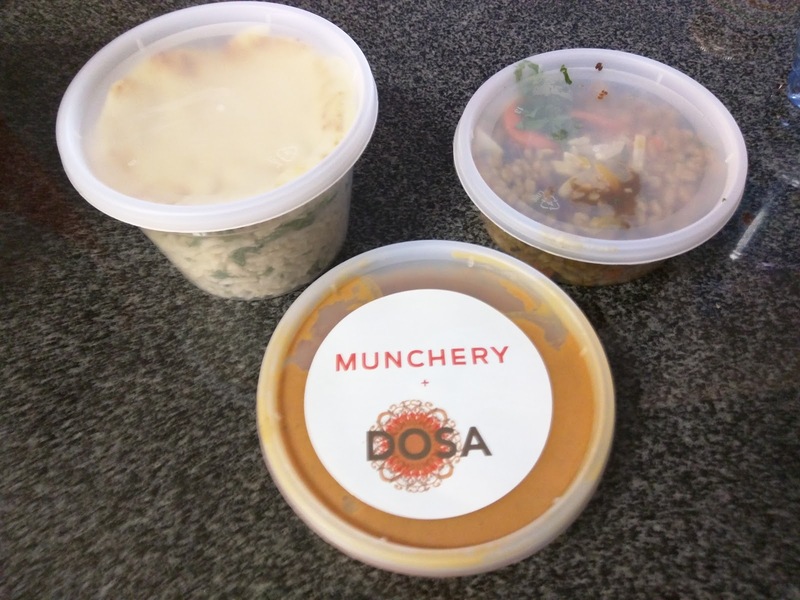 I unpackaged my tower to reveal a trio of containers, the topmost one even had a DOSA sticker on it, showing off the Munchery and Dosa collaboration. At first I was a bit confused, as I knew the dish was supposed to come with tikka masala, plus rice, naan, and the random farro side dish. I saw only three containers, not four. One seemed to be rice, one farro, and one the tikka masala. Where was my naan? Whenever I get indian food, I always mostly use naan to lap up my sauces, leaving the rice for Ojan. I'm just not a rice girl. I was disappointed, and went to re-read the description on the website. I verified that it definitely said it came with naan, but I figured it somehow got left out. I was sad, but pressed on. And then I saw it - the naan was actually in the container with the rice. I opened the rice/naan container to investigate further. The little circle of bread fit perfectly inside the container. They clearly planned this. I've never seen naan packaged this way before though, usually when ordering from indian restaurants the naan is wrapped in foil (although in those cases, I guess they are trying to keep it warm, where Munchery doesn't have that need? Still, a bit odd to put the naan in with the rice, when everything else was nicely separated). Let's take a moment to talk about naan. They don't actually serve naan at the Dosa restaurants, since they are a south indian restaurant. For bread, they serve the signature dosa and uttapam, along with paratha, bhatura, and poori. But no naan. Munchery obviously realized that the masses are used to getting naan and rice with our curries, so, they include both. Which, I appreciated. 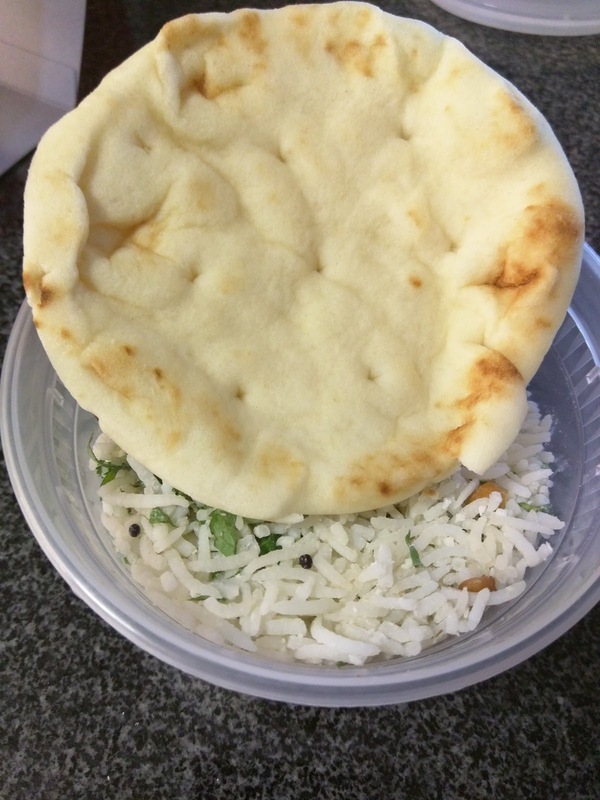 I lifted the naan off the top of the container, expecting there to be a divider of some sort between the rice and naan. There wasn't. Hmm. I assumed this meant the naan would be soggy, but, somehow it wasn't. And that naan. I'll be honest - it didn't look very good. I always get at least garlic butter naan when I get naan, and this was plain, not even any butter (or ghee) in sight. It also lacked any charing or evidence that it had been cooked in a tandoor. It looked like just slightly thick generic white pita bread that I could get at a grocery store. Hmm. Still, I popped it in the toaster oven for a few minutes, to see what would happen. The result? It was ... decent. It obviously didn't magically sprout a butter wash, or get smoky characteristics from a tandoori oven, but it was not dried out or stale, and toasted up really nicely. I quite enjoyed dunking it in the tikka masala sauce, and was really glad they included naan in the dish. The size was just right too, as it was plenty for one person without feeling like a carb overload. The rice was long grained basmati rice with some spices in it. It was light, fluffy, quite fragrant. I'm certainly not a rice lover, but this was really surprisingly well prepared. I liked the spices, and I couldn't get over how fluffy it was. The coconut flavor was subtle, but a nice touch. The rice reheated perfectly in the microwave. A side of coconut rice at the restaurant is $3, so the overall price of $11.95 on Munchery seems quite reasonable. Next, I moved on to the spiced farro, the very confusing side dish. The meal seemed complete as it was, an entree with both rice and naan as sides, so I'm not sure why another side dish, particularly a grain based one, was included. If anything, some veggies seems more fitting? 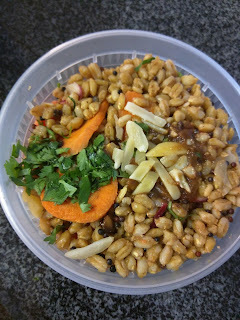 Anyway, the spiced farro dish was intended to be served cold, as a grain based side salad. It had a few slices of carrot and radish, plus some crunchy slivers that seemed sorta like almond (do they use almonds in indian food?). On the very top was also some greenish brown goo of some sort, which might have been what was in the little side bowl in the stock photo? I'm not sure what that was either, but it was really tasty. I wish there was more, and that it was on the side so I could mix it in as I wanted. The slices of vegetable were crispy and fresh, and I liked those too. I didn't really care for the farro itself, but, that is just me not being a big grain lover. It was well spiced. After I ate it, I looked up "Fire Broth Rasam" on the Dosa website, and found that it is served as an appetizer, a soup, a "spicy broth of tomatoes, tamarind, lentils and black pepper, sipped from the bowl like miso." For this dish, they used the broth to actually cook the farro I think. It certainly explains all the spicing of the farro, plus the few random little lentils, and plentiful black pepper. Overall, interesting, not something I'd ever order, and very random with the rest of the meal, but the flavorful goo was nice. And finally, the entree. The portion looked a little small at first, but combined with the generous serving of coconut rice, the naan, and the farro, it was more than enough for a meal (and in fact, Ojan and I split it, followed by dessert of course). The chicken tikka masala was really quite good. Now, I don't actually like chicken. I wished it was paneer. But, we often get chicken tikka masala / butter chicken / etc because Ojan likes it, and, well, I love the sauce. Honestly, my favorite indian food "meal" is garlic butter naan, butter chicken *sauce*, and some saag paneer. I love to mix sauces, and dunk naan in the sauce. So I'm used to getting a chicken dish, primarily for the sauce. I did try one chunk of chicken, and I was impressed, it was moist and seemed good quality. The container had probably 5 or 6 chunks in it. The sauce though, that is what I was there for. And it was great. Really nicely spiced, some actual heat to it (medium that was really medium! ), and plenty of it. There was more than enough sauce for me to slather on the naan and some rice (which yes, I ended up going for some of the coconut rice, because it was that good ... for rice), and for Ojan to still have enough to coat his chicken. Overall, really quite good, and better than similar dishes we've gotten for delivery from indian restaurants around town. Just like naan though, Dosa doesn't actually serve tikka masala at the restaurant.